The pregame pep talk wasn’t exactly inspired by Knute Rockne. The Pirates responded with grit. For almost half the game, they battled a more talented North Central squad to a standoff. Reality struck early in the third quarter and North Central pulled away to win 75-28. 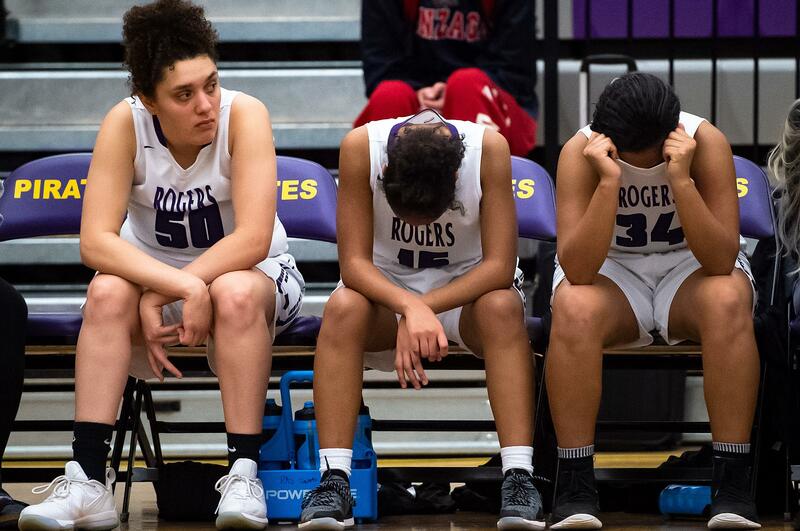 It was another Rogers loss to a neighboring school with more resources and more support – more of everything except fighting spirit. “We’re getting better – that was the best first half we’ve had all year,” Wickering said. It was a small victory, but perhaps there will be larger ones in the future thanks to Monday’s news from the Washington Interscholastic Activities Association. The governing body for high school sports approved a change allowing schools where most kids are from low-income families to play sports at a lower classification. Based on initial projections, Rogers would drop from the 3A ranks to 2A. That would pit sports teams from the school against those from schools such as Deer Park, East Valley, West Valley, Clarkston and Pullman. For Rogers it would mean more travel but also more hope. The changes would go into effect in fall 2020, which isn’t soon enough for some. If that feels like raising hope by lowering the bar, so be it, said Lori Wyborney, the principal at Rogers and a member of the WIAA representative assembly. “It’s about educational ethics,” said Wyborney, who leads a school where 76 percent of students receive free- or reduced-price lunches, a measurement used to gauge student poverty. “Our coaches focus on the small victories,” said Rogers athletic director Aaron Brecek, who was speaking for every athlete and coach at schools in low-income neighborhoods. However, the bottom line – winning and losing – is inescapable. Like many educators, Wyborney sees the communal link between athletic success and self-esteem, whether or not the student participates in sports. “It changes the culture of the school,” Wyborney said. Rogers isn’t the only school facing an uphill battle on the field and on the court. At both North Central and Shadle Park, almost half the students receive free and reduced-price lunches. The WIAA’s new classification criteria would allow them to play in 2A as well. With so many families financially struggling, paying for sports camps and equipment is an afterthought. The Aspen Institute, a national group that advocates increasing access to youth sports, also takes an annual survey of sports participation. It’s increasing overall, but not among households with incomes below $50,000. The recent drop is even more severe for households earning less than $25,000; only 34 percent of children from those households played at least one team sport in 2017, compared with 56.5 percent overall. At more-affluent schools, talent is developed and nurtured through sports camps that many in Spokane’s poorer neighborhoods can’t afford. The skills gap grows as children mature, and many high school students in low-income households take jobs to help support their families. Others are sidelined by dysfunction at home. It all adds up to leaving many school sports programs, especially football, without a deep talent pool. The schools also are short on coaches. In less than two years as athletic director, Brecek has hired nine coaches, mostly internal hires, because outsiders often “don’t know what they’re getting into,” he said. Girls basketball coach Lindsay Hernandez knows the score. A 2004 Rogers graduate, she served as an assistant, then took over the program last year when the head coach left abruptly with two games remaining in the season. “The morale piece is that it’s so hard running into all these other schools, it would take a near-perfect game to have a shot,” Brecek said. During the past four seasons, North Central football team is 6-32 with two wins in the GSL – both over Rogers, which is 3-34 in the same span. In girls basketball this year, the Pirates are 0-19, losing by an average of 49 points. A bright spot is the softball program, with the slowpitch and fastpitch teams holding their own against the bigger schools. Five years ago, a talented boys basketball team went 15-8, swept several larger GSL rivals and came within one win of state. Often, most games are lost years before they are played, especially in club-centric sports such as soccer and volleyball. In better-off neighborhoods, youth sports programs nurture athletic talent for children as young as 6. “A lot of our families can’t afford to do that,” Brecek said. Wyborney has no illusions that success in the 2A ranks will be easy for the Pirates. Schools like East Valley and Pullman have solid athletic programs and often hold their own against larger schools. Wyborney is playing the long game, a metaphor for the classroom as well as the court. She was the state high school principal of the year in 2015 partly because of her work that has helped improve student achievement and graduation rates. During her eight years as principal, graduation rates have risen from 60 percent to above 80 percent. If success can happen in the classroom, why not on the court? After the basketball game, Coach Hernandez considered the subject of life imitating sports, and vice versa. “It’s so much more than the Xs and Os on the court,” Hernandez said. “There’s a lot of work that needs to be done about how to work hard and to not give up. Published: Feb. 2, 2019, 5 a.m.